Since the Sony Xperia Z2 is not coming to the US any time soon, those of you who want to purchase this year’s flagship from Sony are going to have to either import it or buy an unlocked model from a reseller. Neither is an affordable option. Importing from the UK could run you upward of $900, while most of the unlocked resellers in the US have the price of the Xperia Z2 set no lower than $750. That’s a lot of cash for a smartphone. 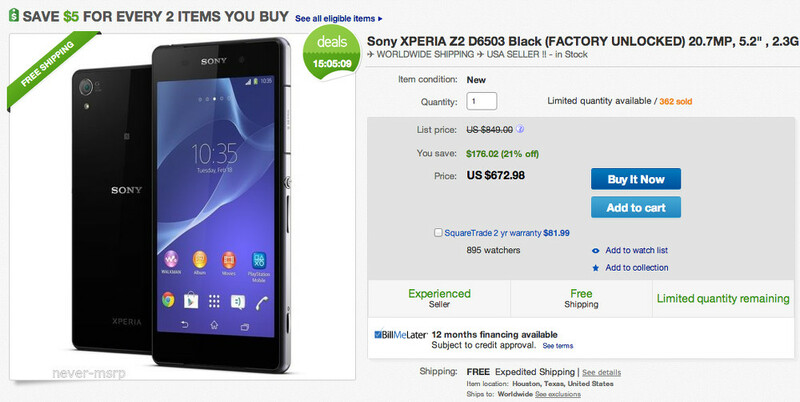 But, if you really, really want the Xperia Z2, then you may want to rush over to eBay today for the best price I have seen to date. Through a daily deal, you can pick up the device for $672.98, which includes free expedited shipping. That’s almost $100 less than most resellers. That may even be cheaper than what Sony will sell it for on its own website later this summer. The phone listing claims that it will work fine on AT&T, including LTE. I can tell you that my unlocked unit works fine on AT&T. I’m running Cricket (formerly Aio) and seem to hit my 8Mbps cap on every speed test. This model appears to be the same as the model I have. The listing says there are “limited quantities” available, so if you are interested, you may want to cruise over there soon. We have already unboxed the Xperia Z2 and compared it to devices like the Galaxy S5 and HTC One (M8). Be sure to check out all of those videos. Our review will be ready shortly.